The paper industry boom of the 1920s continued into the early 1930s, despite the onset of the Great Depression. Strathmore did not seem to feel the effects of the economic climate immediately as the number of its paper lines remained steady until 1938. Between 1930 and 1932 the company overhauled its sample books with redesigns that finally reflected the new Art Deco aesthetic that had belatedly reached the United States in 1927. But the designs were increasingly limited to the covers, as the sample designs that had long characterized the interiors were being eliminated. In addition, the sample books were standardized at 6 x 9 inches in size with the vertical format being preferred. The change in the size and orientation of the sample books coincided with the hiring in 1932 of Bert C. Chambers (b. 1895) as Strathmore’s outside design consultant, a position he held until 1957. Chambers had previously been affiliated with The Aldus Printers, Inc. in New York, a company famous for having introduced the Jean Berté Water Colour Process to the United States in the mid-1920s. The mysterious process—which was licensed to printers—produced amazingly brilliant matte colors with letterpress that rivaled pochoir, a hand stenciling process then popular in France for reproducing illustrations. An explanation of the process, which used water-color inks, rubber plates, and rubber rollers, was published by Aldus in 1929. Recent research by Nan Ridehalgh has revealed that the process was not French as its advertising had implied but actually a 1925 American invention by Chambers, John P. Knierim and George S. Messing. Advertisement (c. 1929) for Aldus Printers and the Jean Berté Process. Design by Gustav B. Jensen. Courtesy of Nan Ridehalgh. 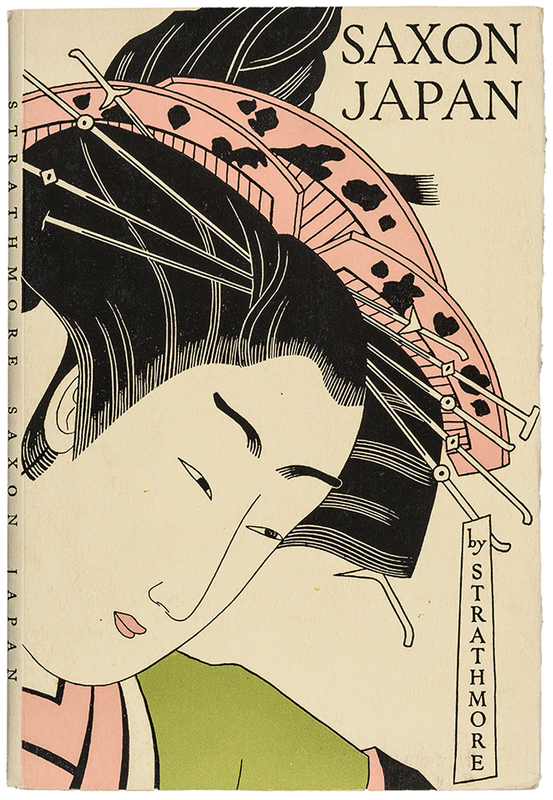 Strathmore Japan swatch book (Strathmore Paper Co., 1932). Illustration by Catherine Mellen (pseud. Alexander King). Photograph by Vincent Giordano. 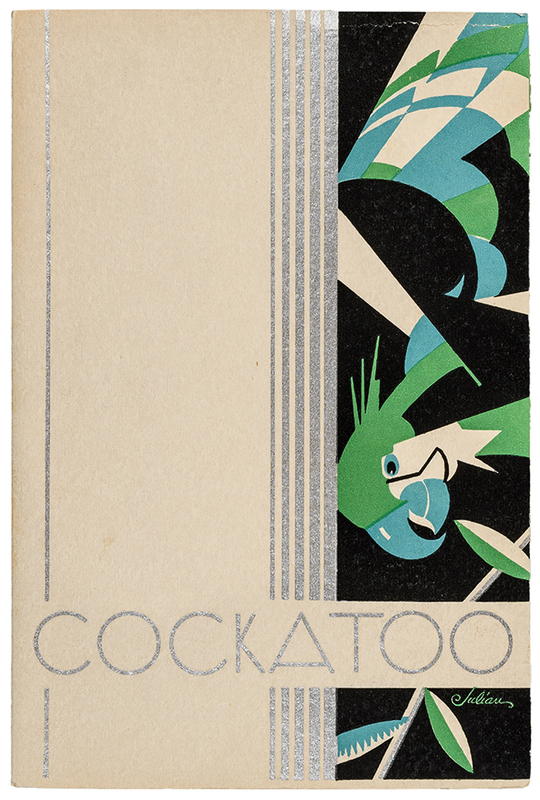 Cockatoo swatch book (Strathmore Paper Co., 1931). Illustration by Julian. Photograph by Vincent Giordano. 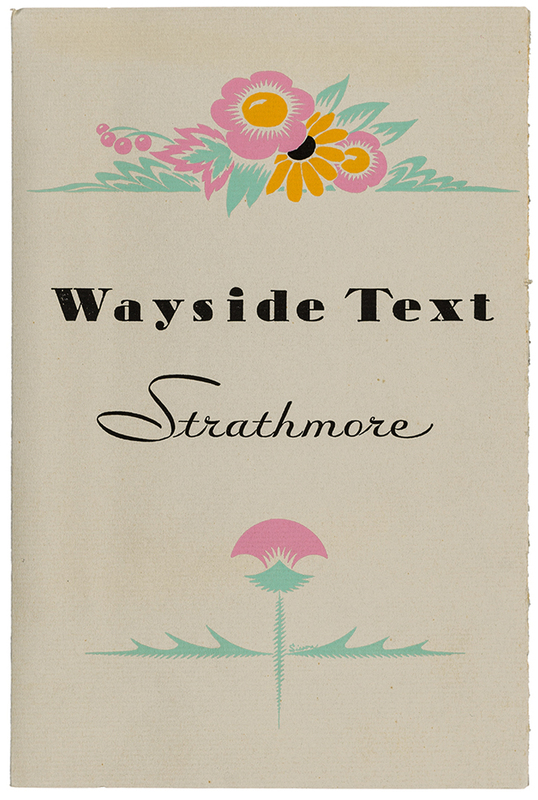 Wayside Text Strathmore swatch book (Strathmore Paper Co., 1931). Designer unknown. Photograph by Vincent Giordano. In the early 1930s Strathmore’s slowly eliminated the sample designs in its sample books, effectively turning them into swatch books that did little more than show the printer the colors, weights and textures of a given paper line. These swatch books were standardized at 6 x 9 inches and the vertical format became dominant. This contrasted strongly with the 10 x 6 1/4 inch horizontal sample books designed by Will Bradley when he reorganized the combined Mittineague and Woronoco mill paper lines in 1912. There was clearly an economic rationale for the 1930s standardization, but it was also a response to the inconsistent sizes and formats that characterized the sample books of the 1920s. It is hard to know how much impact Chambers had on this change as some of the new-size swatch books are dated 1931. The cover designs of the vertical swatch books vary greatly in style from imitation Cubism to Art Deco to pseudo-Asian painting to stock-like illustrations. Unlike the 1920s most of the illustrator/designers are anonymous. The few names that are known come from a small catalogue accompanying a 1957 exhibition of the advertising material produced under Chambers’ direction during his tenure at Strathmore. 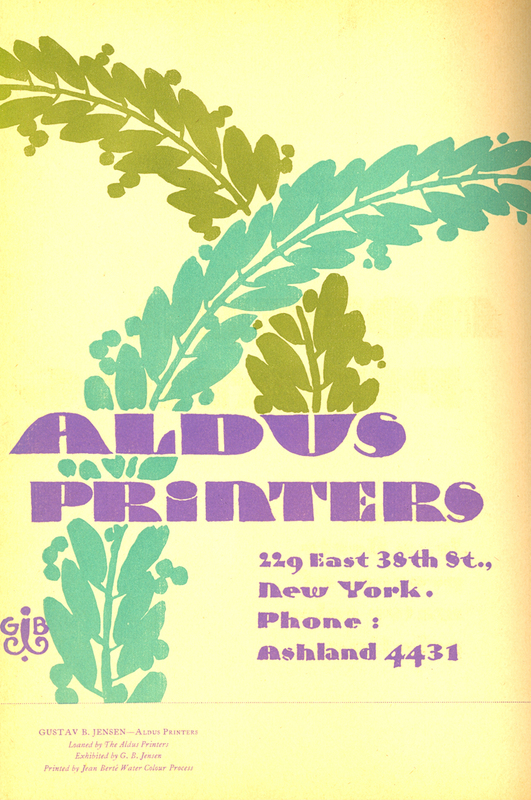 One of those names was designer Catherine Mellen who had been associated with Chambers at the time Aldus Printers was taken over by The DeVinne-Hallenbeck Company in 1933. 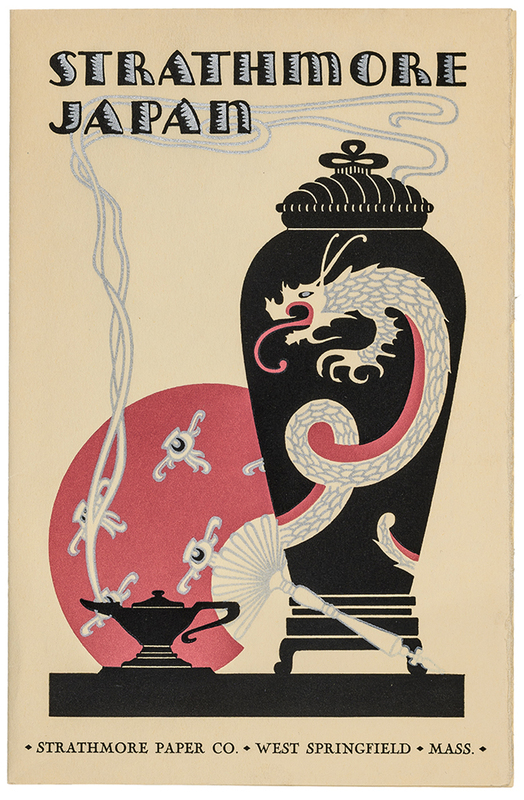 Mellen, one of many pseudonyms of illustrator-turned-raconteur Alexander King (1900–1965), was responsible for the Saxon Japan (1932), Strathmore Japan (1932), and Strathmore Silverflake and Goldflake Deckle Edge (1933) swatch books. A few of the early 1930s swatch books were horizontal in format. Oddly enough, all were created by well-known designers of the day: W.A. Dwiggins (1880–1956), Lucian Bernhard (1883–1972), Rudolph Ruzicka (1883–1978), George F. Trenholm (1886–1958), and Charles Capon (1884–1954). 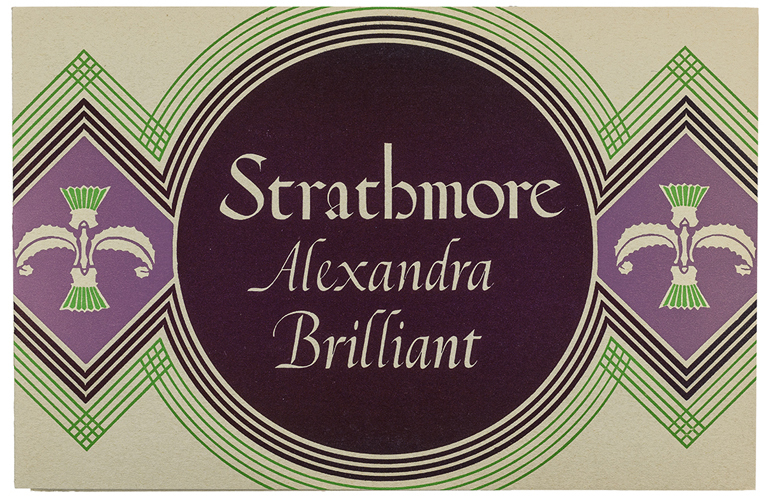 Strathmore Alexandra Brilliant swatch book (Strathmore Paper Co., 1931). Design by Rudolph Ruzicka. (Note the thistles which come from A Grammar of Color.) Photograph by Vincent Giordano. Beginning in 1934 Strathmore began to use plastic comb bindings for some of its swatch books and wire-o metal bindings for its promotional materials. This seems to be an industry first. The wire-bound mailers were cheaper than the complicated folding posters of the early 1920s. Several of them were also significantly larger than those of the past, with Strathmore: The Stylist in Expressive Printing Papers (1935) measuring 9 1/4 x 11 3/4 inches. Its appropriately stylish cover was the work of Eduardo Garcia Benito (1891–1981), a leading fashion illustrator of the Art Deco era. The elegant woman with doves was a refreshing contrast to a trend toward the use of more industrial imagery on a number of the swatch books (a clear response to the Depression). This was the first use of “Expressive Printing Papers,” a phrase that Strathmore stressed in the decade and a half following World War II. 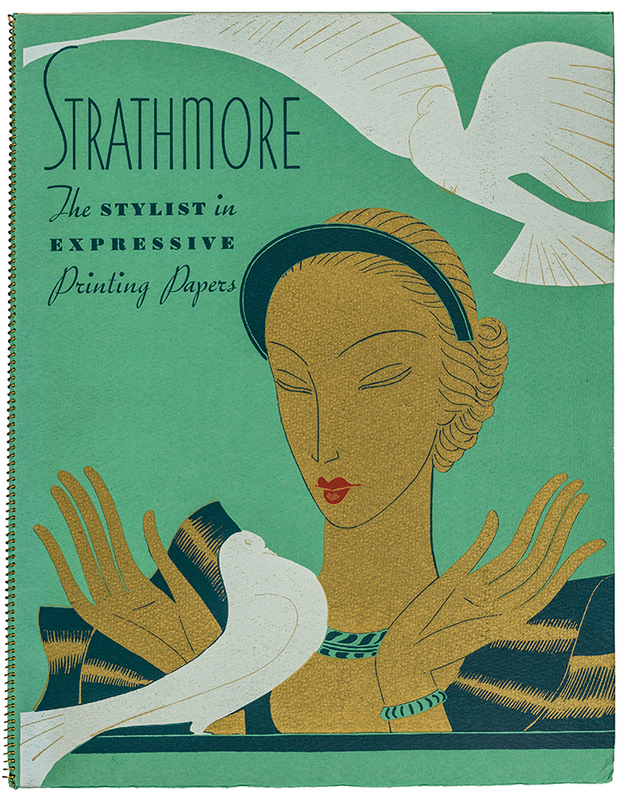 Strathmore: The Stylist in Expressive Printing Papers promotional mailer (Strathmore Paper Co., 1935). Illustration by Eduardo Garcia Benito. Photograph by Vincent Giordano. 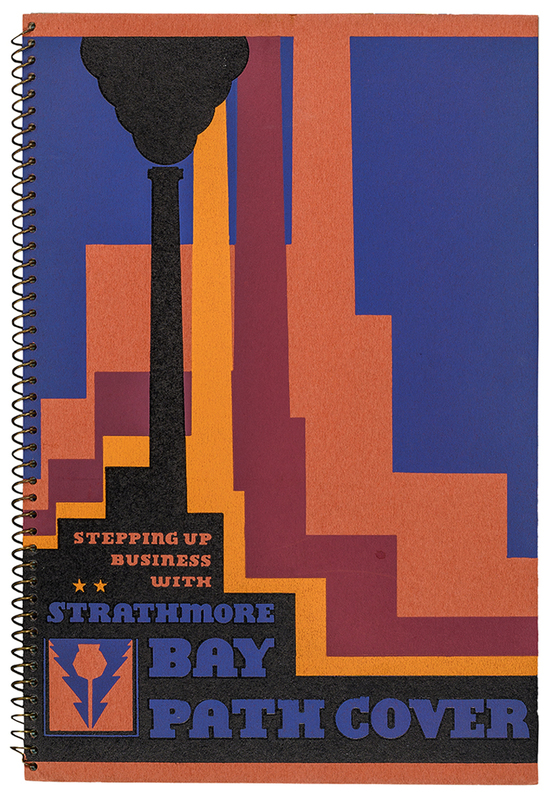 Stepping Up Business with Strathmore Bay Path Cover promotional mailer (Strathmore Paper Co., 1934). Designer unknown. Photograph by Vincent Giordano. 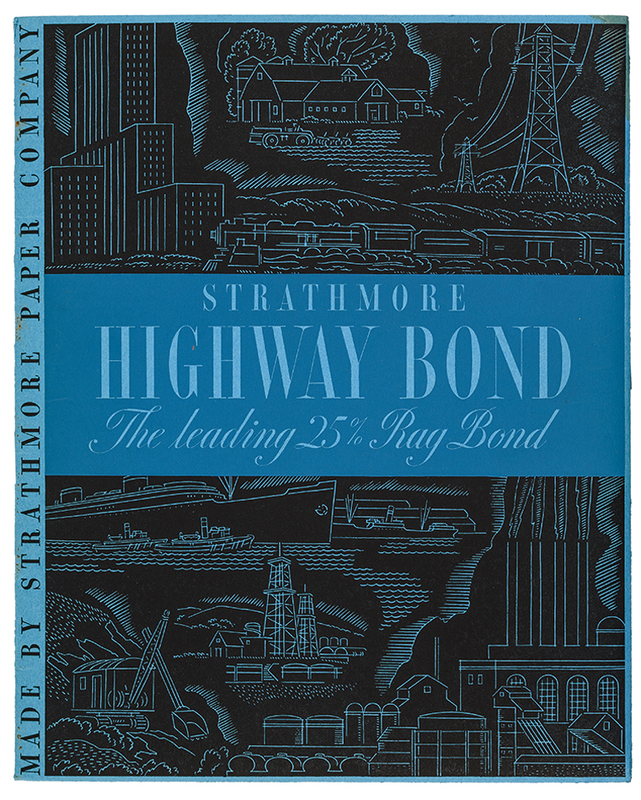 Strathmore Highway Bond promotional mailer (Strathmore Paper Co., 1936). Designer unknown (possibly Charles Capon). Photograph by Vincent Giordano. The Great Depression fully caught up to Strathmore by the end of the decade as its paper lines, numbered at 49 before the Stock Market Crash of 1929, shrank to 38 in 1938 and then to 32 the following year. In 1939 the company instituted “The Staple Papers” campaign to convince printers that its papers, despite a longtime emphasis on Strathmore quality, were not luxury items but were competitive pricewise with those from its rivals in the industry. The campaign was a warm-up for the pressures that Strathmore was about to face during World War II.